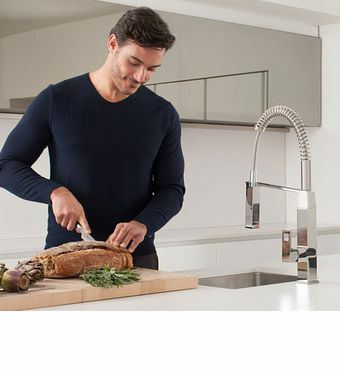 NEW YORK, July 9, 2015 – High style and user-friendly application seamlessly blend together in the new Eurocube® Semi Pro faucet, which launches in August as the latest kitchen innovation from GROHE, the world’s leading single-brand manufacturer and supplier of kitchen and bath fittings. This new product combines the functionality of the popular GROHE K7 Semi Professional faucet with the company’s geometric Eurocube design. 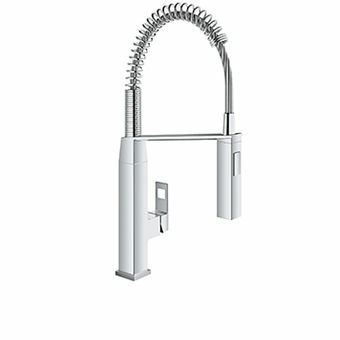 Showcased above, the new Eurocube Semi Pro kitchen faucet from GROHE, launching in August 2015, in the GROHE Starlight® Chrome finish. “Eurocube Semi Pro is the result of the continuous demand of home chefs and amateur cooks who desire professional-grade faucets in their kitchens without sacrificing sophisticated design elements,” said Cheryl Dixon, Head of Brand Trade and Marketing for GROHE America. Designed with the needs of these cooking enthusiasts in mind, Eurocube Semi Pro offers a sturdy yet flexible metal pull-out spray, a 360-degree swivel arm and one-hand operation, providing the ultimate ease of use to complement the natural rhythms of a busy home chef. With the rocker-diverter, users can easily switch back and forth between two spray settings without turning off the water, while the high spout makes filling pots, rinsing dishes and washing the sink all the more convenient. With the launch of Eurocube Semi Pro, shown above, GROHE is the only manufacturer to offer a cube-inspired semi pro faucet complete with dual spray settings, a 360-degree swivel arm and a forward rotating lever for anti-backsplash. GROHE is the only manufacturer to offer a cube-inspired semi pro faucet complete with dual spray settings, rocker-diverter, a 360-degree swivel arm and a forward rotating lever for anti-backsplash. These features are combined with the industry-leading technologies that consumers have come to expect from GROHE. Among them are GROHE SilkMove™ ceramic cartridges that provide a lifetime of smooth and effortless handling.“Being able to have the pull-out spray and lever easily glide with your natural movements is essential for those who love to cook,” Dixon pointed out. For added comfort, the edges of the hand shower have been slightly rounded. GROHE’s SpeedClean® anti-lime system removes lime scale with a single wipe, reducing cleaning time and ensuring a lifetime of performance. In addition to this, GROHE StarLight® gives Eurocube Semi Pro a diamond-like sheen that resists stains and tarnishes. The faucet will be available in the GROHE Starlight® Chrome and Supersteel Infinity™ finishes. “Eurocube Semi Pro meets the needs of a discerning consumer by providing commercial-grade performance with trend-forward design to maximize enjoyment in the kitchen.” Dixon concluded. The GROHE Group is the world’s leading provider of sanitary fittings, comprising Grohe AG, Hemer, Hamburg and other subsidiaries in foreign markets. With its global GROHE brand, the GROHE Group relies on its brand values quality, technology, design and responsibility to deliver “Pure Freude an Wasser”. The GROHE Group was purchased by the LIXIL Group and the Development Bank of Japan in January 2014. The LIXIL Group is the global leader in the building materials and housing equipment industry. For more information and to find local showrooms, please visit www.grohe.com/us or call 1-800-44-GROHE (47643).